Tina Butler is “The Mom” behind the blog Mommy’s Kitchen. 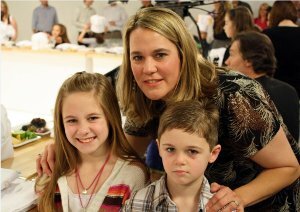 Tina resides in Texas with her husband Corey of 13 years and their 3 beautiful children. She started blogging back in 2008 as an outlet for her passion of cooking, baking and recipe collecting. Her blog features comfort food, down home cooking and dash of old fashioned flare. Tina grew up in the kitchen learning to cook from the best, her mother. As an adult she came to realize that a lot of people were not as lucky as her to have someone show them how to cook. Those are the readers she reaches out to. Tina’s goal is to get families out of the fast food line and back to the dinner table family style. Her motto is… anyone can learn to cook all you have to do is be willing to try. Tina has set her blog up with step by step recipes in full photographic tutorial, so anyone can follow along. If anything she hopes that her site will inspire you to get back into the kitchen and enjoy cooking. Tina states that cooking and baking can be trial and error. Heck you may even mess things up, but that's OK. Just pick yourself up, dust off your apron and keep trying. She promises that you will get it.